How Is the Center Frequency of a Monocycle Waveform Measured? 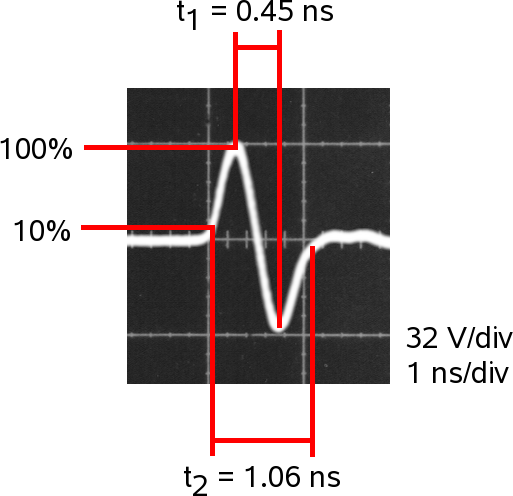 Avtech uses two methods to estimate the center frequency of a monocycle waveform. The first method is to measure the time between the positive and negative peaks of the waveform, and consider this time to be one-half of the period. The second method is to measure the time between the initial point where the output amplitude is 10% of the positive peak and the last point where the output amplitude is 10% of the negative peak, and consider this time to be equal to one period. The waveform below illustrates these techniques for one waveform. These produce slightly different results, of course. Overall, the center frequency of the waveform can be estimated as ~ 1 GHz, using these two calculations. Intuitively, this seems correct, since the waveform fits almost entirely into a 1 ns wide area (one division on the oscilloscope photo), and 1 / 1 ns = 1 GHz. Other methods can be used, of course, such as matching a "best-fit" curve of a particular mathematical equation to the waveform, or performing a Fourier transform, etc. However, since the actual waveform produced by monocycle rarely matches any ideal mathematical curve, Avtech uses the above "quick estimates" instead.